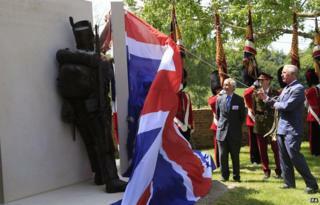 Prince Charles has unveiled a memorial to the British soldiers who fought and died at the Battle of Waterloo. The prince and the Duchess of Cornwall visited the Belgian battlefield before unveiling the memorial at Hougoumont Farm, a key site in the fighting. Relatives of the three commanders at Waterloo also attended the unveiling. The 9th Duke of Wellington, Prince Nikolaus von Blucher of Prussia and Prince Charles Bonaparte also took part in a symbolic three-way handshake of friendship at the event. The farm at Hougoumont played a crucial role in the victory of the Duke of Wellington's allied army over Napoleon's French forces in 1815, and saw some of the fiercest fighting of the battle. The memorial depicts two life-size soldiers struggling to close the farm's north gate to save it from being overrun by the French. Soldiers from the Coldstream Guards managed to shut the gate and Wellington later said the outcome of Waterloo "turned on the closing of the gates at Hougoumont". In front of the great North Gate of Hougoumont Farm, descendants of three Waterloo commanders shook hands, and remembered the events which reshaped European history. The 9th Duke of Wellington, Prince Charles Bonaparte and Prince Blucher von Wahlstatt (pictured left to right), were here to celebrate today's Europe, and to remember the thousands who still lie on this battlefield. Hougoumont Farm looks much as it did in 1815, thanks to a seven-year restoration programme; here British and Hanoverian troops held their nerve against a much larger French force, and passed into military folklore. It was chosen as the site of the first memorial commissioned to mark the endeavours of the whole British army at Waterloo, and unveiled by Prince Charles after a tour of the rolling farmland where more than 40,000 men were killed or wounded. Among them were the forerunners of today's Guards Regiments - soldiers who had taken part in last weekend's Trooping the Colour ceremony - who donned period uniforms to mirror events at the gates. This event was the first of many over the next few days. Tens of thousands of visitors will gather to watch more than 5,000 re-enactors recreate the battle as the Waterloo story unfolds once more. In a reversal of history on Wednesday, 10 Guardsmen from No 7 Company Coldstream Guards, dressed in 1815 period costume, carried out the official opening of the gates at the farm. While other monuments recognise individual regiments that fought at Waterloo, the sculpture by Vivienne Mallock is the first to pay tribute to all British troops. Prince Charles and the Duchess of Cornwall took a tour of the battlefield, starting at La Belle Alliance Farm - which served as Napoleon's headquarters. Accompanied by the 9th Duke of Wellington - they then walked along a farm track, skirting the edge of the battlefield site. The royals - along with Belgium's Princess Astrid - also took a tour of Hougoumont, which has undergone a £3m project to restore it following years of neglect. Camilla has a direct connection with the new monument as her great-great-great-grandfather, John Whitehill Parson, fought at Waterloo while serving with the 10th Regiment of Light Dragoons. Barry van Danzig, a trustee of the Hougoumont Project which led efforts to restore the farm, said the closure of the gates "ended 800 years of conflict between France and Britain and brought in 100 years of peace", describing it as a "cornerstone of European history." He added: "The monument to the whole British Army is important - we all hear about Wellington's victory but it was the guys on the ground that did it." More than 5,000 enthusiasts are due to perform battle re-enactment displays over the weekend as the bicentenary commemorations continue. The prince and duchess will attend, along with the Earl of Wessex, the current Duke of Wellington, senior members of the armed forces and descendants of those who fought at Waterloo. The battle was fought after French emperor Napoleon conquered large swathes of Europe, before being defeated by allied forces in 1814. He was exiled to the Mediterranean island of Elba, but escaped the following year, and on 18 June 1815 his troops again faced the combined allied forces at Waterloo - about 10 miles from the Belgian capital, Brussels. Both men were 46, with formidable military reputations when they faced off on the battlefield. The battle started at 11:00 and ended by 20:30. The decisive factor was the arrival of Prussian forces from the east, leading to Wellington's historic victory.